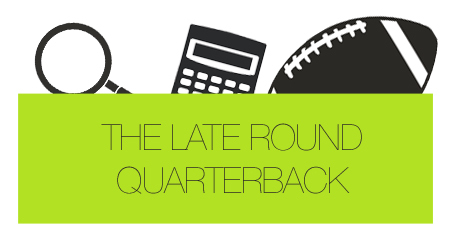 The Late Round Quarterback staff put together their wide receiver rankings for the 2013 season. The following rankings are based on standard scoring in redraft leagues, where each touchdown is worth six points and one point is rewarded for every 10 rushing or receiving yards. Much like the running back rankings, there is a clear-cut choice for the top receiver. All seven staffers placed Calvin Johnson atop their rankings. You shouldn’t find a set of receiver rankings anywhere that have another name at the top. If you do, hit back on your browser as quickly as possible and never return. Five of the seven staffers had A.J. Green and Brandon Marshall slotted second or third, with Chad and Keith as the exceptions. Chad opted to rank Dez Bryant second, and Keith gave his number 3 ranking to Demaryius Thomas. Here are the wideouts who were ranked in everyone’s top 10: Calvin Johnson, A.J. Green, Brandon Marshall, Dez Bryant, Demaryius Thomas, Julio Jones and Roddy White. The first real outlier comes with Percy Harvin. I ranked Harvin 11th (reasoning: only played 16 games once, never had more than 967 yards) while no one else had him lower than 8th, with five writers placing him 5th or 6th. Phil is low on Randall Cobb, a 2012 breakout player, putting him 17th. Everyone else had him as a number one option, somewhere between ninth and 12th. The staff was pretty split on Vincent Jackson. Four ranked him no worse than 9th, and the other three had him anywhere from 12th to 15th. That’s not too surprising considering Josh Freeman’s inconsistency and the mercurial nature of V-Jax. Chad moved Larry Fitzgerald back up into number one status as his 7th ranked receiver, banking on Bruce Arians and Carson Palmer to reignite his career. While Chad likes Fitzgerald, he’s not a fan of Victor Cruz. Five writers had the Giants’ big-play weapon ranked between 10th and 13th. I placed him 8th while Chad dropped him to 19th. As usual, no one knows what to make of Dwayne Bowe, who has a 1,162-yard, 15-touchdown season to his name but had just 801 yards and three scores a year ago. Three staffers ranked him at least 16th, two put him in the 17-19 range and two others ranked him 26th and 27th. The staff had similar discrepancies with Miami’s Mike Wallace. Chad and Ladd ranked him 18th and 19th, respectively. Keith and I put Wallace in the mid-20s, while Phil, Sal and JJ see him as a flex option, ranking the former Steeler in the 30s. As to be expected with receivers, the deeper we dig into the list, the more incongruities we find. Phil barely ranked Josh Gordon, sliding him in 47th. JJ (31st), Chad (25th) and Sal (25th) all like the second-year Brown, each ranking him as a borderline number 2 wideout. Phil left rookie Tavon Austin outside of his rankings while five of the six other writers had him between 33rd and 38th. Chad placed Jeremy Maclin 29th, while Sal and I didn’t have him in our top 50. DeSean Jackson was placed as high as 32nd by Sal, while Phil had him in the low 40s. I chose not to rank him. Justin Blackmon ranges from 32nd to unranked, which was no surprise given his suspension. Two writers put Anquan Boldin in the late 30s, and three didn’t rank him.